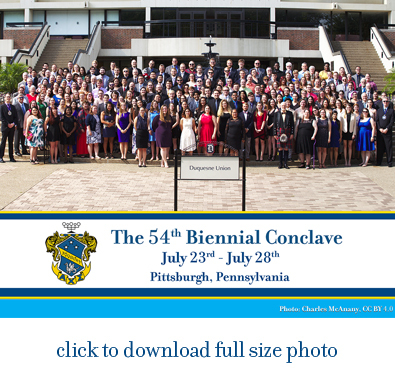 Conclave is a meeting held in even numbered years where Brothers of the Fraternity gather to conduct national Fraternity business, to exchange ideas about chapter operations and to interact with each other to further the Objects of the Fraternity. Each collegiate and professional chapter sends an elected delegate to Conclave to discuss and vote on the issues brought forward. Professional Representatives, District Counselors and members of the Supreme Council also debate and vote on these matters. This legislative body is called the Grand Chapter. The Grand Chapter consists of the Grand Chapter Officers, the District Counselors, the Professional Representatives, the Master Alchemists of each active collegiate chapter, and the President of each active professional chapter. When the Grand Chapter is assembled at Conclave, chapters are represented by their elected delegates. The Grand Chapter decides how business to be conducted, amends the Constitution and Bylaws and conducts any other business that is needed. The decisions made at Conclave control the operation of the national Fraternity. The most important business of Conclave is the election of the new Supreme Council, which will serve for the next biennium. One of the most valuable aspects of Conclave are the many opportunities to meet other members from across the country. Through structured programs held at Conclave and informal encounters, attendees can solve their chapters' problems, share ideas about chapter or house operations, and develop new friendships. The Nominations Committee solicits candidates for the Supreme Council and Professional Representative positions. During Conclave, this committee acts as election judges, counting votes for the Supreme Council election. This committee is a standing committee of the Fraternity and functions at all times, not just during Conclave. The Constitution and Bylaws Committee prepares and/or reviews all legislation related to the Constitution and Bylaws for wording, consistency, and accuracy. This committee only exists for the duration of the Grand Chapter Conclave. The Financial Advisory Committee reviews all legislation to estimate its effects on the Fraternity finances. This committee only exists for the duration of the Grand Chapter Conclave. The Legislative Preparation Committee helps delegates present all Conclave motions in proper written form. All Conclave motions must go through this committee before they can be presented. This committee only exists for the duration of the Grand Chapter Conclave. The Resolutions Committee prepares and/or reviews and transmits to the Legislative Preparation Committee the resolutions of greeting and appreciation. This committee takes care of any legislation that does not fall under the jurisdiction of the Constitution and Bylaws committee. This committee only exists for the duration of the Grand Chapter Conclave. A variety of awards are presented at each Biennial Conclave. The awards are given for the Best Collegiate Chapter, Most Improved Collegiate Chapter, Best Professional Activity, Award for Conclave Attendance, Best Professional Chapter, as well as the Kuebler Award, Scholar Award, Chapter Advisor Award, Star Chapter Awards, and many District Counselor Citations and Certificates of Appreciation. A record of each Conclave is created containing all of the motions made, if they were approved, as well as the election records of the new Supreme Council. To view a record of each of the past five Conclaves, click below. While the main purpose of the Grand Chapter Conclave is to conduct the business of the Fraternity, it is much more than that. Conclave is an excellent opportunity to meet Brothers from all over the country and exchange ideas. Click below for a complete list of past Conclaves.